PROVO — Imagine if BYU’s offense could figure out how to play the second half like it does the first. For the third consecutive week, the Cougars racked up huge chunks of yards and scored a bunch of points in the first half, only to sputter at times over the final two quarters. While that scenario unfolded again Friday night at LaVell Edwards Stadium, BYU quarterback Taysom Hill and the defense led the Cougars to a convincing 37-20 victory over Boise State. “It was a really big win for our program,” Hill said, noting that it was BYU’s first-ever victory over the Broncos. 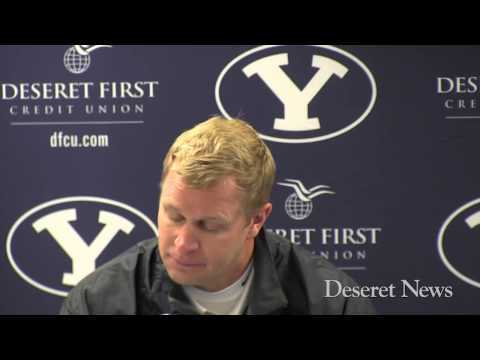 “It was a big game, a big stage, against a really good opponent,” said coach Bronco Mendenhall. “We took control of the game early. Hill completed 21 of 28 passes for 253 yards and two touchdowns in the first half and finished 27 of 41 for 339 yards, with three TDs and zero interceptions. “Taysom, for a lot of the game, looked completely composed and 'unrattle-able,'” Mendenhall said. BYU rolled up 568 yards of total offense on the night. Meanwhile, the Cougar defense forced four fumbles against the Broncos, who gained 499 yards of total offense. Not only was it BYU’s first win ever against Boise State in four tries, but it also ended a 21-game losing streak for teams from the state of Utah against the Broncos. The Cougars (6-2) are riding their first five-game winning streak since 2009, and became bowl eligible for the ninth consecutive season. After the game, BYU officially accepted a bid to play in the Fight Hunger Bowl in San Francisco on Dec. 27 against a Pac-12 opponent. Boise State, meanwhile, dropped to 5-3. Friday’s loss snapped a streak of 50 consecutive victories for the Broncos in the month of October, a streak that dated back to 2001. Hill got the Cougars going early with a 21-yard run for a touchdown in the first quarter. BYU led 17-3 after a 37-yard TD pass from Hill to Ross Apo with 3:45 left in the second quarter. On Boise State’s ensuing possession, Bronco receiver Shane Williams-Rhodes fumbled the ball after a hit by Craig Bills. Remington Peck recovered to give BYU’s offense the ball at the Boise State 47-yard line. Six plays later, Hill connected with Hoffman on a 5-yard touchdown as Hoffman wrested the ball away from the Broncos’ 5-foot-9 cornerback, Donte Deayon. Hoffman broke BYU's all-time touchdown catch record on that play — surpassing Austin Collie — and it put the Cougars up, 24-3, with 44 seconds left until halftime. Hoffman has 31 career TD catches. A 40-yard touchdown pass from Hill to Mitch Mathews midway through the third quarter lifted the Cougars to a 31-6 advantage. That was BYU’s last TD of the night. Boise State’s offense scored its first touchdown against BYU in six quarters on a 5-yard keeper by quarterback Grant Hedrick to make it 31-13. But on Boise State’s next series, the Cougars forced another fumble — caused, again, by Bills and recovered by Kyle Van Noy. The Cougar offense didn’t fully capitalize on the Boise State turnovers. However, placekicker Justin Sorensen did drill a pair of second-half field goals to keep the Broncos at bay, including a 41-yarder with 7:08 remaining to seal the win. In all, Sorensen hit three field goals. Senior safety Daniel Sorensen took a knee to the head while making a tackle near the sideline in the second quarter. He lay motionless in front of the Boise State bench for several minutes before walking off the field with assistance. Sorensen did not return to the game. NOTES: Announced attendance was 62,954. BYU has a bye next week and will return to action on Nov. 9 at Wisconsin. Boise State safety Dillon Lukehart was ejected in the third quarter for a targeting penalty in the end zone against Hoffman.